(Newser) – Back when he was still just teasing a presidential run, Beto O'Rourke told Vanity Fair he was "born to be in" the race, the AP reports. Now that he's campaigning to far greater media attention and much larger crowds than many Democrats who've been competing longer, they are taking offense at the former Texas congressman's sense of entitlement. 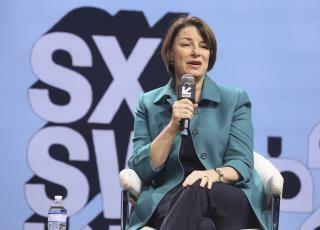 Minnesota Sen. Amy Klobuchar drew the sharpest such contrast on Sunday, saying "I wasn't born to run. But I am running" while acknowledging, "Oh, that's the Beto line." She said on NBC's Meet the Press, "No, I wasn't born to run for office, just because growing up in the '70s, in the middle of the country, I don't think many people thought a girl could be president." Asked about the same O'Rourke quote, Mayor Pete Buttigieg of South Bend, Indiana, was gentler, saying on Fox News Sunday that "I think I was born to make myself useful." Still, other Democrats have taken more veiled swipes. Julian Castro, who hails from San Antonio, has pointed to references that he's the "other Texan" in the White House race and says that though he's not the front-runner now, he will eventually overtake better known candidates like O'Rourke. When asked about the Vanity Fair quote, New Jersey Sen. Cory Booker said that he's dedicated his professional life to working with "communities that are really being left out and left behind." New York Sen. Kirsten Gillibrand said she'd be more willing to fight hard for Democratic values than promote the kind of feelgood, bipartisan optimism that O'Rourke favors. Such intraparty fighting is uncommon with the election still about 18 months away and marks a contrast to how nice the crowded field of Democrats running was to one another before O'Rourke's announcement. "taking offense at the former Texas congressman's sense of entitlement." LMAO the irony!! democrats upset over entitlement mentality! LOL!!! new headline: Entitled Democrats Jealous of Other Entitled Democrats. The 2020 creepy clown show...Biden and O'Roarke, and that guy that calls himself "Spartacus"
back when I was young, I would have bet Beto didn't have a shot... no experience... BUT now-a-days, just about anything is possible. In any case, he sure won't be my candidate... BUT while we are on the subject, the Dems are upset about his sense of entitlement? Did they totally miss Hillary's?